The Kata RL-302 GDC Laptop Rucksack is designed for professionals/executives on the go. The backpack will organize, store and protect equipment, as well as traveling gear. Two storage options are available; A padded, laptop shoulder bag is integrated in the TST protected mid section of the rucksack allowing for quick & immediate removal when necessary or using the laptop slot in the rear compartment. 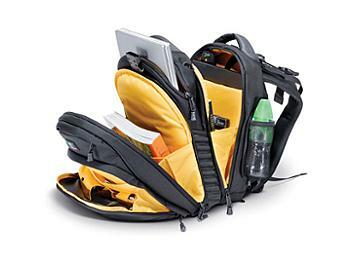 - Backpack designed to hold a laptop computer with photo or video gear and accessories. Rear compartment with laptop slot plus organizer panels will hold folders, paperwork, laptop accessories and much more. Numerous designated pockets throughout, will hold all your personal effects such as mobile phone, PDA, PM3/4 player, etc. Type of Closure - Zippers: Silent action YKK coil and molded zippers , Buckles: ITW and Duraflex Nylon and Acetal buckles.